People who follow government guidelines to have a drink or so a day could be drinking themselves into an early grave, researchers said Thursday. Any more than five drinks a week on average can take years off a person’s life, the new study of more than half a million people around the world shows. That’s less than what's recommended in many countries. For instance, the U.S. Centers for Disease Control and Prevention and the American Heart Association both say men can safely drink up to two alcoholic drinks a day and women up to a drink a day. A drink is defined as 12 ounces of beer, four ounces of wine, or 1.5 ounces of 80-proof spirits. An international team of researchers looked at data from 600,000 people in 19 countries, who were asked about drinking habits dating back as long ago as 1964. They were followed for years afterward. 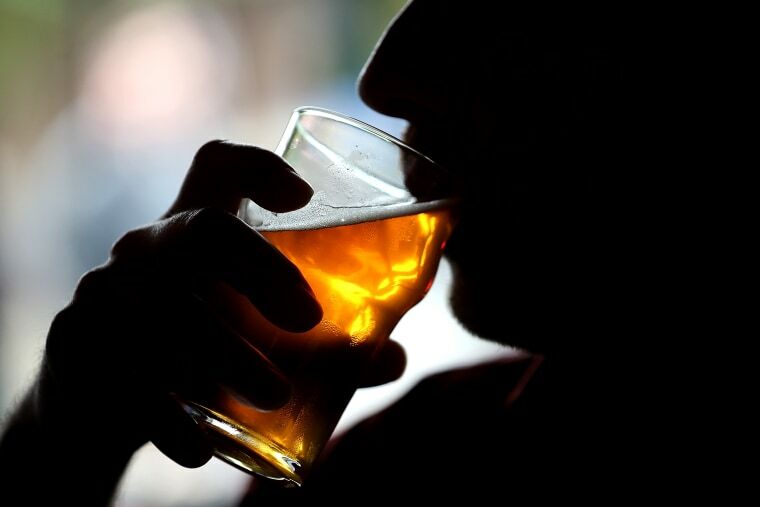 People who reported drinking more had higher rates of stroke, heart disease, deadly high blood pressure and fatal aortic aneurysms, the team reported in the Lancet medical journal. “The paper estimates a 40-year-old drinking four units a day above the guidelines has roughly two years lower life expectancy,” said David Spiegelhalter, a risk expert at Britain’s University of Cambridge who was not involved in the study. The most people can get away with and not raise their risk of early death was about five glasses of wine a week or the equivalent, the researchers found. Many people can drink far more than that in a single day. The CDC says more than 38 million American adults admit to binge-drinking once a week and guzzle an average of eight drinks per spree. "The key message of this research for public health is that, if you already drink alcohol, drinking less may help you live longer and lower your risk of several cardiovascular conditions." The CDC says that more than 2,000 Americans die each year from acute alcohol intoxication. It’s no secret that alcohol can be bad for health in other ways, too. Drinking raises the risk of both cancer and heart disease, and one study suggested that drinking accounts for 15 percent of breast cancer cases. The risk starts rising with as little as one drink a day on average. The American Institute for Cancer Research and the World Cancer Research Fund recommend in a joint report that people limit alcohol. People who do not drink at all can have worse health, also — something that can confuse consumers and doctors alike. So the researchers, led by Cambridge University’s Dr. Angela Wood, used only information about people who were current drinkers “because ex-drinkers include people who might have abstained from alcohol owing to poor health itself, as well as those who have changed their habits to achieve a healthier lifestyle,” they wrote. They found that the more people drank, the higher their risk of death compared with people who drank less. If a 40-year-old man dropped his intake from two drinks a day to around five drinks a week, he could expect to add an average of a year or two to his life, the researchers projected. "We should always remember that alcohol guidelines should act as a limit, not a target." What’s the safest drink? It might be wine, sipped a little at a time, the study suggested. "Exploratory analyses suggested that drinkers of beer or spirits, as well as binge drinkers, had the highest risk for all-cause mortality," the researchers wrote. "The key message of this research for public health is that, if you already drink alcohol, drinking less may help you live longer and lower your risk of several cardiovascular conditions," Wood said in a statement. "We should always remember that alcohol guidelines should act as a limit, not a target, and try to drink well below this threshold,” said Victoria Taylor, a senior dietitian at the British Heart Foundation. The study’s likely to be controversial, said Jason Connor and Wayne Hall of the University of Queensland Centre for Youth Substance Abuse Research in Australia. "The drinking levels recommended in this study will no doubt be described as implausible and impracticable by the alcohol industry and other opponents of public health warnings on alcohol,” they wrote in a commentary. "Nonetheless, the findings ought to be widely disseminated and they should provoke informed public and professional debate."